Damascus, Syria, 27 March 2017 – For 37-year old Kawthar and her 8-year old son Mohammed, life has become unbearable. Kawthar got divorced few years back and moved to live at her parent’s house in one of the poorest neighbourhood in Damascus. She lives with her mother, two brothers, and sister. “I have no option but to squeeze ourselves together at night, because my parents’ house is tiny, with only two bedrooms,” says Kawthar pointing to one of the single beds in a dark shabby rooms. What exacerbated the family’s living condition was not the continued shelling, but the water cuts, which lasted for over 40 days during winter. In late December 2016, water was cut in Damascus and its surrounding areas following attacks on the two main sources – Wadi Barada and Ain Al- Fijeh springs – leaving an estimated 5.5 million people without access to safe water and increasing their risk of water-borne diseases. “In Syria, water has been used as a weapon of war by all parties to the conflict,” says Hanaa Singer, Representative in UNICEF Syria. “Water sources have been deliberately shut off, water infrastructure has been attacked and damaged, and water workers were denied access to maintain, repair, and operate water networks,” she adds. In 2016, the United Nations has documented 30 such tactics in Damascus, Aleppo, Hama, Raqqa and Dara’a. Kawthar and her family, like millions of people in Damascus area, were forced to ration water when water was cut. In her tiny kitchen, Kawthar recalls how they use to pile up the dirty dishes and wash them once a day so that they will not lose much water. She also remembers how they used to wash their laundry by hand to save water, and then re-use the water to clean the floor. In recent weeks UNICEF has completed emergency water repairs in seven different locations in Wadi Barada and the Ein Al Fijeh spring to restore water flow. As a result, access to water has significantly improved for the 5.5 million people residing in Damascus and Rural Damascus. UNICEF’s team was able to monitor the on-going water repair work in Ein Al Fijeh and Wadi Barada after the team was granted access during the first ever humanitarian convoy to Wadi Barada. Located in one of the poorest and historical neighbourhoods of Damascus, Kawthar’s house was severely impacted by rainfall during the winter season. And to make things worse, the main sewage system, being old and not well-maintained, started clogging up with dirt and debris. One morning Kawthar and her family found themselves jumping out of the frying pan, into the fire. Located at the entrance of Kawthar’s house, one of the sewer system flooded and toxic sewage backed up into their house. It destroyed the flooring, the drywall, furniture and anything that came in contact with. “The whole house was in a state of chaos. Sewer roaches, rats, ants, cockroaches invaded our house,” Kawthar recalls with outrage. “I used to disinfect the whole house, and I even brought some cats, but it was not enough to protect us from the invading pests,” she adds. Like most people across Syria, Kawthar and her family are struggling to make ends meet, and the sewer flooding over-stretched their already meagre household income. “We lost thousands of Syrian Pounds as a result of the sewer floods,” she explains with sadness in her eyes. 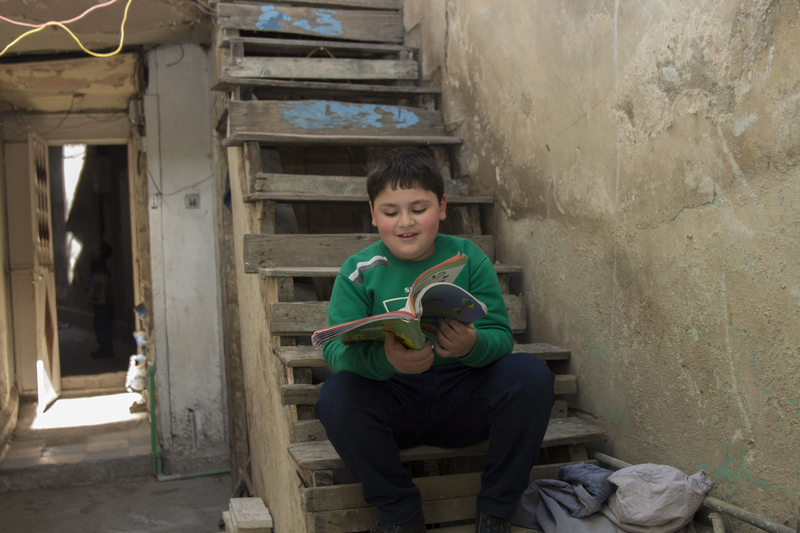 For Mohammad, the entrance of his grandparents’ house used to be his main play area. Like most mothers in Syria, and out of fear for his life, Kawthar did not allow Mohammad to play outside the house and put him at risk of being injured by the constant shelling. “I used to play ball with my next door neighbour Abdel-Ghani at the entrance of the house, but when the sewer flooded, my mom did not allow me to play there,” he adds with a grin. Kawthar usually wakes up early morning to get Mohammad ready for school. During the past two years, as the family suffered from the sewer system clogging, she woke up before dawn to clean the entrance of the house to enable Mohammad to go to school. The plight of the conflict is beyond the scores of death, injuries, and internal displacement of children and their families. Kawthar’s family is one of the millions of people in Syria enduring unimaginable suffering due to the six years of war. “No one in Syria is spared from the brutality of the conflict,” says Singer. “Coping mechanisms are eroding fast and families are taking extreme measures just to survive.” she adds. Two weeks ago, with partners UNICEF repaired the sewer system in Kawthar’s neighbourhood enabling the family to restore some sense of normalcy amidst the chaotic life they have been living. Mohammad and Abdel-Ghani resumed playing ball at the entrance of the house. “I want to become an accountant,” says Mohammad playfully. As a 3rd grade student, Mohammad is among the best students in class. “My favourite class is mathematics,” he prides as he opens his mathematics book to complete his homework. Like his father, Mohammad is a vegetarian, but he loves junk food. “My favourite dish is French fries,” giggles Mohammad. Feeding Mohammad nutritious food has become a challenge for Kawthar. Living off her brother’s small income, she cannot afford buying Mohammad the nutritious food he needs to consume for his age. In Syria, six million children are in need for humanitarian assistance. Yet, despite this chaos, there are many remarkable stories of children and families like Mohammad who are determined to pursue their hopes, dreams and aspirations for a better future. “UNICEF’s work is more urgent than ever to support children to realise their dreams,” says Singer. “More importantly, Syrian children and their families have one wish – to return to their homes and to live in peace and dignity, and we must provide them with the opportunity to do just that,” she adds.